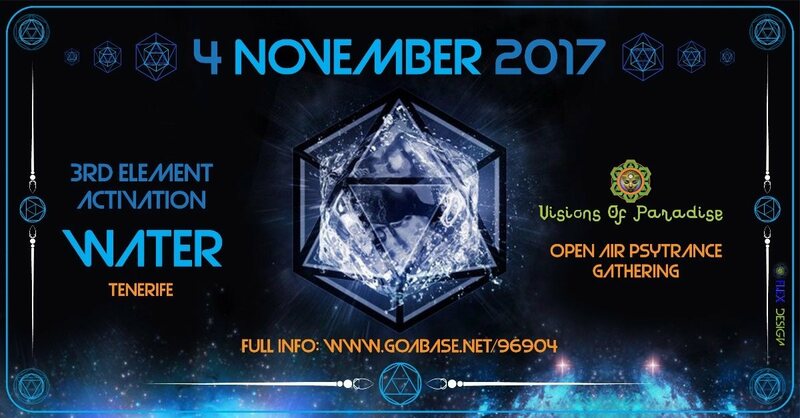 After the first two elements, fire and air, we reconnect with the ancient tribal spirits on the magical island of Tenerife and call on our psychedelic family to reunity with us once again under the light of the full moon. Like our beloved psychedelic trance music, water is a quintessential element to life and it manifests itself in many different forms and shapes troughout the universe. In fact, our human race is mosthly made of it! - Secret Location, directions one day before the party! - Line up is closed... Booking requests are futile! Y corre la primera Izquierda Y sigues La carretera paralela a autopista en dirección Sur. And take the first Left and follow The road parallel to the highway heading South. Pass the pyrotechnics factory and a tunnel to the right ... and enter a dirt road to the party ... you will pass some machines and works ... and you will find the party. It's just before the tunnels in the open air.